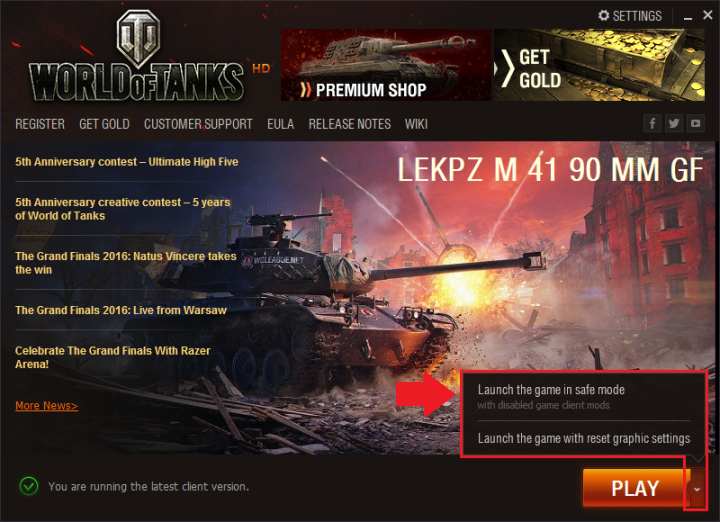 A number of mods (or in-game modifications) are allowed for use at your own risk in the World of Tanks client. However, mods may make the game unresponsive or cause crashes. The first step to identify, and potentially address, this issue will require you to start up WoTLauncher and start WoT in Safe mode. After this, World of Tanks will start without your installed mods. Should the game run correctly in Safe Mode, please delete all your mods and/or make sure you update them to match the current game version. You might also want to try deleting the game settings by running the program found here. However, if none of the previous steps were successful, please submit a ticket to our Support team so they can assist you and be sure to attach a WGcheck report.